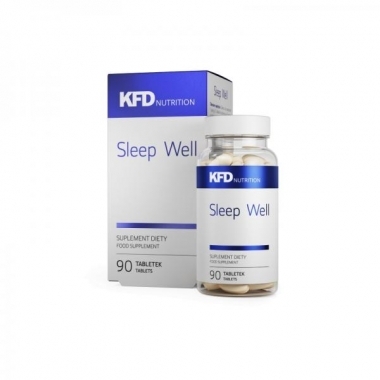 KFD Sleep Well is an innovative, multi-ingredient KFD supplement that improves sleep comfort and supports regeneration with the only recipe on the market for supplements. Composition created for people training strength and endurance sports. Contains sleep hormones, adaptogens and herbs that improve mood and regeneration and helps to fall asleep during periods of increased stress. The supplement contains gaba (gamma-aminobutyric acid) - a popular neurotransmitter that supports our regeneration during sleep, l-tryptophan, which is a precursor of melatonin (sleep hormone), magnolia extracts, goat's liver, and Asian crinkle. Crocuse extract to help reduce the unpleasant effects of stress and overtraining.